Frieda Loves Bread: "What's For Dinner?" I wish I knew how to cook better. I don't have the time to cook. I hear these comments often. I am fortunate that I have a mom that learned to cook, bake bread, and had a meal on the table just about every night. I am lucky that I have the time to cook. I am not a gourmet cook, yet I love to create something that my family enjoys. I love the memories that I have of coming home from school and having cookies and milk. I want those same memories for my kids. 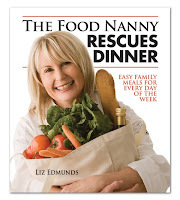 I met Liz Edmunds, author of The Food Nanny Rescues Dinner book. She is an amazing, smart, and energetic woman who has been through it all. Her mother always had a dinner meal ready every night, with her family around her at the dinner table. Liz, as a young mother of seven children, she recognized and appreciated what her mother was able to do...every night! Like me, she wanted the same memories of homemade food and togetherness around the dinner table. She understands women and the hectic lives that we live today...whether you are in college, a single mom, a parent of many children, or an empty nester with no children at home. Getting a healthy homemade dinner ready every night can be a challenge! She answers that challenge in her new book and gives us her 30 years of experience. Do you feel like you don't know how to cook? Check your newspaper. Chances are there are free cooking classes in your area. Community schools, grocery and kitchen stores are always hosting monthly classes. Get together with another mom, learn to make a meal and split it. Try a new recipe, take notes on what went well, and try it again. This is how I am learning to cook. When I was in college, I had six roommates. We each took a turn and planned a meal. We ate together almost every night and forged close friendships. In the end, we exchanged recipes. As a young mother, I had pizza every Friday night and spaghetti every Monday. I would try to rotate my main dish meats each night....beef, chicken, pork, fish/meatless, repeat. I quit when one of my kids said, "Spaghetti? Again?" This is Liz's dinner menu plan...it's even better. She creates a two-week menu plan and it only takes her 10 minutes. The ten minutes that she spends SAVES her frustrated, hectic minutes of scrambling to put something together at the last minute. You can check out and download a sample/blank menu and grocery list here. Need ideas for recipes? Check out Liz's recipe index. Her easy recipes will definitely help those that say, "I don't know how to cook." For additional recipes, get together with friends or neighbors and host a meal or cookie exchange. Everyone brings a meal/cookie plate with copies of recipes to share. This is a good way to taste recipes that work in your area. As the Food Nanny, Liz answers desperate calls by going into the home and giving one on one instruction in meal planning, preparation and organizing shopping lists. The best thing you can do for your family is to have dinner ready at the same time every night. Enlist the help of your children or spouse! You can learn to cook. You can plan a meal. You can create two weeks of meals. You can create some memories that will last a lifetime for everyone in your family. Go for it! Thanks for the post and the links. As half of a DINK couple - we love to cook but can let the time get away from us if we are not careful. Planning at least a week out saves us in take-out expenses and saves us from frozen pizza dinners! It's good to see some real 'systems' that are in place for when our life gets really hectic. Thank you for sharing. What a great idea. I menu plan each week but these are even better tips and I'm sure it will help me be more productive! I was there! I was one of those roomies when we ate together and shared all those recipes. I still use some of those too, like Erin's Stroganhoff, and your soft sugar cookies.